Poor me. Here’s what I look out on while I’m doing laundry. 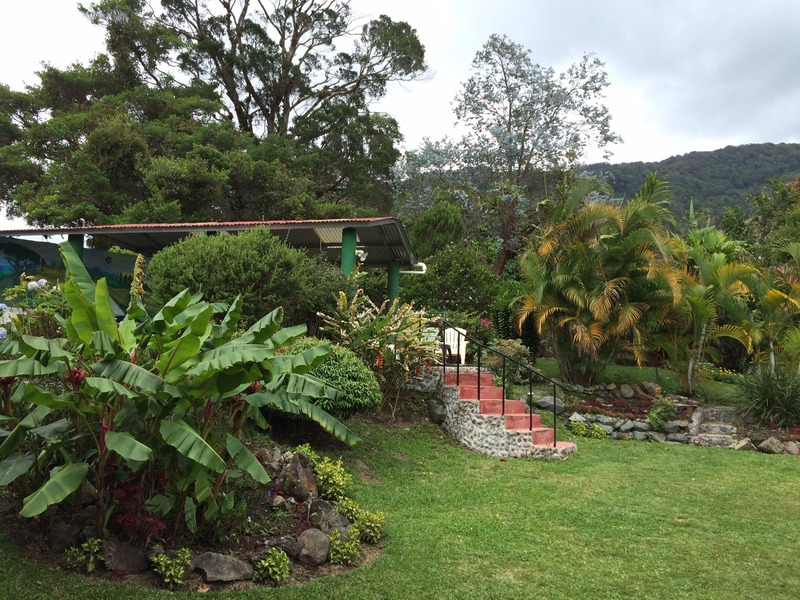 In most Panamanian homes, the washing machine is outside on the patio. John and I are settling smoothly into our new life here. Nothing about this feels routine, yet, but we are establishing somewhat of a routine on week days – especially now that I’m back to working full-time. It goes like this: wake up with the bird song and rooster crow. Make some strong and excellent Panamanian coffee, and get busy checking emails and starting the day’s work projects. Feed the girls and get them out for their morning potty. About now, John gets going on his various projects, one of the biggest at the moment researching local and international health insurance (a complex process and the topic of an upcoming post). John has also been getting out to join hiking groups and do the shopping during the day. It is truly a joy to see him finally relax and settle into life as a retiree, which he richly deserves! Mid-morning, we take the girls for a longer walk or jog. Lunch at home, usually a sandwich or some of our friend Candice’s excellent soup, which we purchase at the Tuesday market. An afternoon of work and then, magically, a glass of wine appears at my desk at 5 p.m. (gotta love that retired person!). After he cooks up something yummy for dinner, we usually try to watch a movie on the laptop but end up crashed in bed by 9:30 or so. Our new friend Bond chillin’ in the swimming hole. If I told you where it is, I’d have to kill you! throughout the day as the clouds roll down and bring the evening’s round of showers. With the windows wide open all day, we can hear the roar of the creek just next to our house – a roar that’s growing louder every day as the rainy season really sets in. I’ve been keeping my camera with telephoto lens handy for the brilliant blue and yellow birds that keep appearing just outside the window, but haven’t managed to capture them yet. That reminds me of something magical. The other morning I was standing at the open kitchen window and a brilliantly green hummingbird buzzed up and hovered, right in front of my face, for a few seconds. Then it took off in search of better pickings (note to self: get a feeder!). The hummers here are legion, and some of them are quite large – about the size of a small sparrow. Weekends are another story. We’ve been very blessed to have made some wonderful friends here already, and they’re including us in some real adventures. 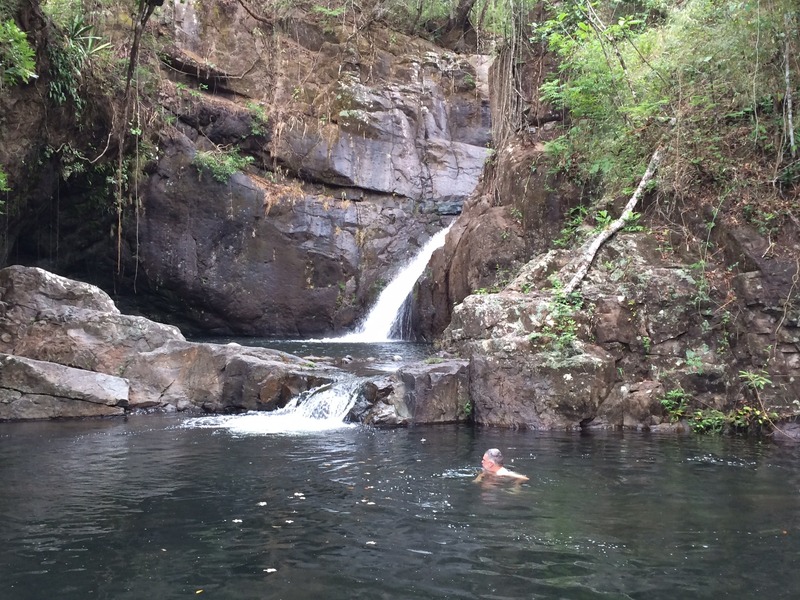 Today was a case in point – we hiked to a waterfall and swimming hole on the Caldera River that rivals anything we ever experienced in Hawaii. 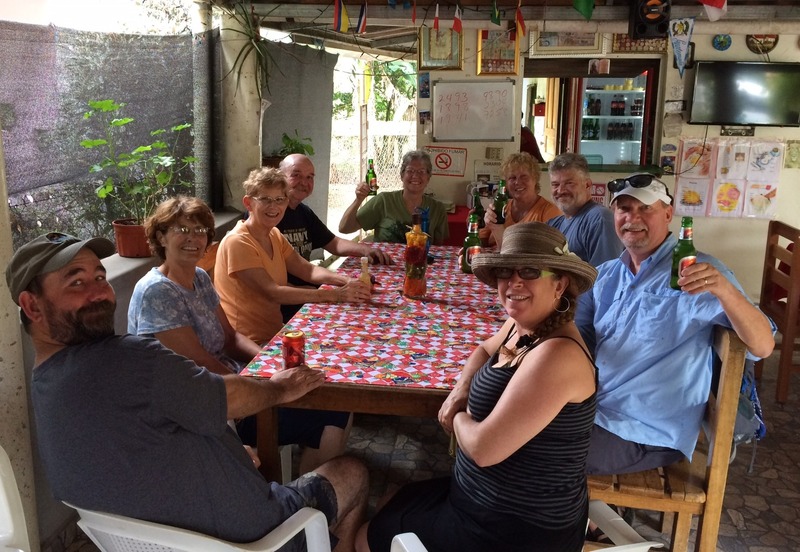 Our group of 10 then had a lovely lunch at a little cafe in the hamlet of Caldera, which is about 20 km from Boquete. And last night, we got to hear our friend Joel perform at the local Spanish tapas bar. How can anything about life in Boquete EVER be mundane? Yippeee, another update! It sounds absolutely lovely and certainly not mundane. You are living life to the fullest as it should be. I can’t wait for your elusive bird photos and maybe even a hummingbird. Many blessings to you! Thank you, Schuttzie! I’m really enjoying your photography – those beach photos are beautiful! Thanks, Eric! Sending you an email. Lovely to follow your adventures! I like getting your blogs and seeing how well you are melting in! Hey my yet to have had a f2f buddies – you were in my neck of the woods the other day – Caldera. My guess? You at Melissa’s – how do I know? LOL – that’s the only place in town.! Haha! You guessed right! I thought of you yesterday. Want to meet up for a coffee sometime this week, maybe at the hilltop Kotowa?